The '70s was a transitional time for Santana. Coming off the commercial and artistic success of the debut album (Santana by Santana), Abraxas, and to a lesser extent, Santana III, Carlos paid homage to his jazz influences with his next few albums: Caravanserai, Love, Devotion, Surrender (with John McLaughlin), Welcome, and Borboletta. Next, he returned to a more pop-oriented sound with Amigos and Festival. Merging these different facets of his personality, then, was 1977's Moonflower: a combination of live and studio tracks that marked his first platinum album since Abraxas. Moonflower was notable for several other reasons, as well. First, it was America's first introduction (on a record) to the band's chief selling point, which was their dynamic live show. Second, it marks the first truly successful integration of Carlos Santana's jazz influences with his Latin-rock melodic chops. 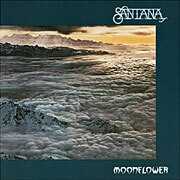 And, last but not least, Moonflower encompasses the nascent "Santana tone;" a smooth, rich, endlessly sustaining guitar sound with which he has been associated for the last three decades. It's easiest to understand Moonflower by separating the songs into studio and live cuts (there are exactly eight of each). On the studio side, all the songs were written by Carlos Santana, Tom Coster, or the two together (they also co-produced the album) -- with the exception of the remake of the Zombies hit, "She's Not There," by Rod Argent. In the instrumental vein are "Zulu," "Bahia," "Flor d'Luna (Moonflower)," and "El Morocco," some of the strongest cuts on the album. While maintaining their individuality, all four songs bridge the gap between the jazz, jazz-rock / progressive, Latin, and rock styles that had influenced Santana throughout his career -- with nods to the Mahavishnu Orchestra, Return to Forever, and other bands from that era. Tom Coster, in particular, plays with both finesse and fervor, alternately comping on piano and clavicord, and soloing on various synthesizers. Not as strong are some of the studio vocal songs: "I'll Be Waiting," "Transcendance" (except for some brilliant instrumental passages), "Carnaval," and "Dawn / Go Within" (which features only a couple of hummed lines). Although Greg Walker is arguably the strongest, most soulful singer Santana has ever had, the melodies he's given to work with are too anemic for him to truly shine. The exception is "She's Not There," on which Walker literally tears up the microphone. Live, however, the band re-visits songs from previous albums, and pumps them up appropriately in front of the crowd. "Soul Sacrifice / Head, Hands & Feet" is a 14-minute version of the song made famous in the Woodstock film; the band throws in a few added riff and does it justice. "Savor," the instrumental tune from the debut album is combined with "Toussaint L'Overture" from Santana III, both are sped up and beefed up, whipping both band and audience into a frenzy. "Black Magic Woman / Gypsy Queen" (Abraxas) demonstrates Carlos' melodic genius, as he uses the original melodies for a starting point and improvises beautifully from there.